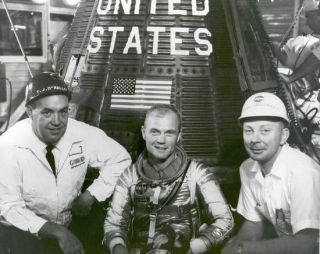 In a photo taken on Jan. 24, 1962, Thomas J. O'Malley, left, and John Glenn sit in front of the Friendship 7 capsule that carried Glenn into an orbit around Earth that February, becoming the first American to do so. O'Malley hit the button that launched Glenn's rocket, and he kept it on display in his Cocoa Beach home. COCOA BEACH, Fla. ? Legendary space industry engineer ThomasJ. O'Malley, 94, died Friday evening, shortly after a phone call from Mercuryastronaut and former U.S. Sen. John Glenn, whom O'Malley launched into space in1962 by pushing a button. O'Malley had displayed the button in the den of his CocoaBeach home. Daughter Kathleen O'Malley said the conversation betweenGlenn and her father on Friday was brief, but she related hearing O'Malley say,"Hello, John Glenn," to the former astronaut. He was called to the human spaceflight program in 1961,while working for the Convair division of General Dynamics, where he was a testengineer for the Atlas intercontinental ballistic missile, according to familyhistorian Cornelia Dean, O'Malley's niece. The Atlas missile had experienced aseries of launch pad explosions. He was "Convair's toughesttest conductor," Mercury astronauts Alan Shepard and Deke Slaytonwrote in "Moon Shot" in 1994. Astronauts remember O'Malley's contributions to the successof the U.S. space program. "He was a hard-driving, honest, straight-up,go-for-broke guy, and he really made things hum down here," Apollo 15astronaut Al Worden said Saturday while attending the Astronaut Autograph andMemorabilia Show at the Kennedy Space Center Visitor Complex. "Everybody knew Tommy, and everybody respected him, andeverybody did what Tommy wanted done," Worden said. "I think he was abig factor in the success of the Apolloprogram." Out of love and respect, O'Malley was nicknamed"Terrible Tommy," Worden said. "We would have not gone anywhere as well as we did downhere in the 1960s and 1970s if it hadn't been for Tommy O'Malley," headded. "I've seen him be really tough, but on the other hand, he was themost fun guy I ever met." After working in the Mercury program, O'Malley became chiefproject engineer for the Electric Boat Division of General Dynamics in Quincy,Mass. In 1967, after a launch pad fire killed three Apollo I astronauts, he wasbrought back to Cape Canaveral to head checkout and launch operations for theApollo spacecraft for North American Aviation. Apollo 13 astronaut FredHaise said O'Malley's drive and work ethic kept America's fledgling spaceprogram on track. "There was a lot of schedule pressure to get spacecraftthrough the mill here and to get them ready to go fly," Haise said. "He was a tough taskmaster, which you had to be in those days. "It was a hectic time, and I think Tom was a goodleader. He kept everything in order." In 1970, O'Malley became vice president and general managerof launch operations for North American Aviation, which later became RockwellInternational. In that position, he led the company's work on Skylaband Apollo-Soyuz missions, as well as on the shuttle program, in which his workled to the first launch of Columbia in 1981. O'Malley was born in Montclair, N.J., and earned abachelor's degree in mechanical engineering at the Newark College ofEngineering, now the New Jersey Institute of Technology, in 1936. He firstworked in aviation at the Wright Aeronautical Corp. in Paterson, N.J., theaircraft manufacturing division of the Curtiss-Wright Corp., before joiningGeneral Dynamics in 1958. Dean recounts this anecdote: "An early riser, O'Malleyfrequently arrived at Cape Canaveral launch pads and other facilities beforedawn. Often, he would get lost in the dark, virtually featureless sandylandscape of the Cape -- until his colleagues installed a streetlight at theroad leading to pad 14, the site of the Glenn launch. A plaque at the basereads 'O'Malley's Guiding Light.' "
O'Malley is survived by his wife, Anne Arneth O'Malley; hisdaughter, Kathleen O'Malley of Merritt Island; his sons, Thomas J. Jr. of CocoaBeach and James K. O'Malley of Merritt Island; three grandchildren and twogreat-grandchildren. Image Gallery - Project Apollo: "Before This Decade is Out"
Contact Peterson at 242-3673 or ppeterson@floridatoday.com. Publishedunder license from FLORIDA TODAY. Copyright ? 2009 FLORIDA TODAY. No portion ofthis material may be reproduced in any way without the written consent of FLORIDA TODAY.